When dealing with traumatic water disaster, you will need to let the professionals at ICC Restoration in Woodbury help clean-up the mess. They will assess the situation and decide what needs to be removed from the area, then they will continue with getting your home back to normal. Homeowners underestimate the amount of water and the amount of damage caused by water. Before the technicians start removing anything, a thorough inspection allows the technicians to know just about how much moisture the house contains. After finding out how much moisture is in the area, the technicians then pump out any standing water and begin the process of drying. If the professionals are called to the home quick enough, they could be able to save flooring and drywall. If it contains at least 25 to 50 percent of moisture, saving the flooring and drywall may not be possible. Also during the drying process, the technicians will also test for various microbes and begin to destroy any found using powerful antimicrobials and fungicides. Homeowners don’t realize that the water can be contaminated, leaving structural problems and biohazardous threats. Dirty water contains many different kinds of deadly substances, causing severe health risks. The deadly substances range from chemical residues to animal feces to parasites. A couple examples of these health risks are salmonella and hepatitis, and the bacteria, viruses, and fungi from flood or sewage water can leave you seriously ill even by momentary skin contact. Call ICC Restoration to ensure that your home or work space is a completely clean and safe environment for you to be in. The homeowner will likely only notice the damage done to the surface, but the professionals at ICC Restoration are trained to look beyond the surface. This way the professionals can ensure that the home or work environment is clean and safe for you to be in. If water is not removed with expertise, the water will get trapped inside drywall, wood, and carpet fibers, causing mold to grow. Moisture is the enemy, it is capable of getting into any space and taking advantage of every structural problem. Mold begins to grow within 48 hours of water being in the area. The mold will also begin to start slipping behind the walls and start to release spores. 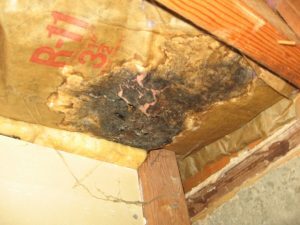 This type of situation can quickly get out of hands if not treated correctly by a certified professional. 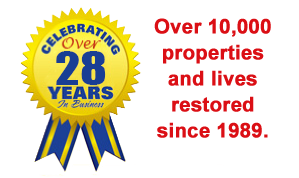 The professionals at ICC Restoration are properly trained and certified in water damage restoration. A lot of technology is used by ICC Restoration’s technicians. These include powerful vacuums and pumping systems, high volume air movers, dehumidifiers, heat injectors, moisture meters, and a number of detergents specially formulated for destroying any type of fungi and other microbial threats. The professionals also wear highly protective equipment to remain free from harm while working in the contaminated area. Always call the professionals at ICC Restoration in Woodbury to clean-up water damage, as it can be extremely hazardous.